Ripe tomatoes, crunchy lettuce, and sweet carrots are just a few of the nutritious foods that will be growing in Winter Park’s newest community garden. 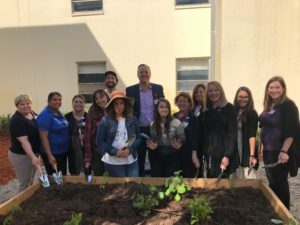 and urban agriculture program Fleet Farming are teaming up to plant a fruit and vegetable garden at the hospital to meet a significant community need: food insecurity. 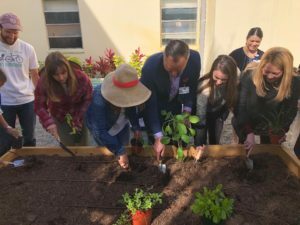 Produce harvested from the garden Winter Park Memorial Hospital will be donated to underserved patients who are discharged from the hospital, and seniors who are shut-in and live within three miles of the hospital. According to a recent study by Feeding America, food insecurity is a significant issue in Florida, where more than 3 million people must choose between nutritious food and other basic living expenses. In Central Florida, one in six people turn to local charitable food assistance programs, according to the latest figures from Second Harvest Food Bank. Food insecurity can have a big impact on health, as certain ailments and chronic diseases can be directly linked to malnourishment. Known for their work harvesting gardens at homes and churches throughout the Audubon Park and Parramore communities in Orlando, Fleet Farming is an innovative farming model that is changing the way communities eat by providing knowledge and education about sustainable farming and by installing micro-farms in front yards. Previous story Congratulations to Winter Park’s Newest Eagle Scouts!